Ashampoo WinOptimizer Free 2018 is the ultimate suite for constant performance of your Microsoft Windows system! Regular maintenance is necessary but time-consuming and requires technical expertise. 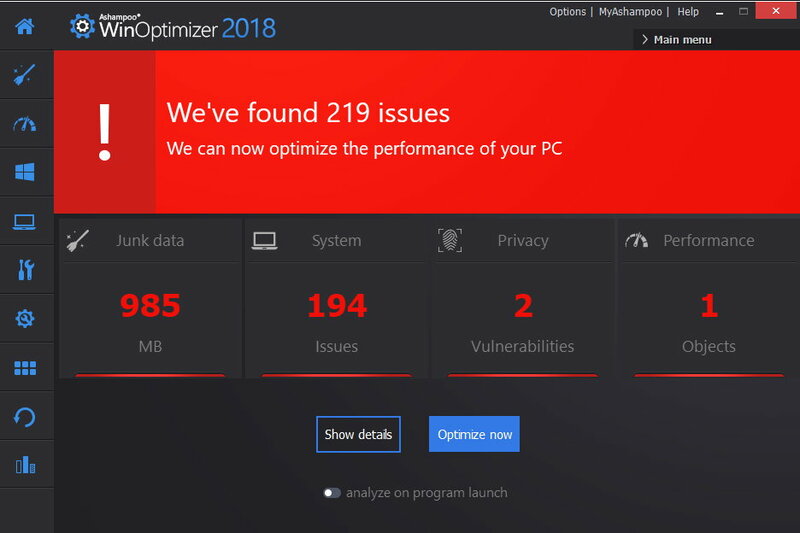 Ashampoo WinOptimizer Free does the maintenance work for you so you can focus on your daily computer work. Free your system from unnecessary data and services that slow down your system. Ashampoo WinOptimizer Free performs a complete system analysis for you. Although it uses a cleverly devised method to find unnecessary data, the software is very easy to use with its intuitive handling. After the scan you can easily sift through the results. To be on the safe side, Ashampoo WinOptimizer uses backup mechanisms so that deleted data can be recovered, if necessary. Reclaim space, eliminate errors, maintain performance, protect your privacy and customize Windows to your needs. Easy, fast and efficiently – with Ashampoo WinOptimizer Free. Ashampoo WinOptimizer offers the opportunity to execute tasks automatically. Features like Defragmentation or the famous One-Click Optimizer can be scheduled comfortably in tasks. The program automatically lists the functions you use in the Favorites tab so that you can return to them quickly. Once you have used a function or module it becomes even easier to use it again. In addition to this the tab also displays interesting information on how you use the program functions – date of use, frequency of use, last use and so on.